But they're just stories, right? Hayden Moore's life was destroyed when his husband, Malcolm, was murdered. Giving up his job as an assistant district attorney in Boston, Hayden moved to the little burg of Maplewood to recover. 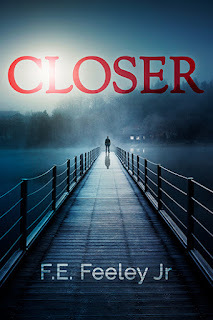 March 1st, 2018 sees the release of Closer - a spectacular supernatural thriller from F.E. Feeley Jr. - not his first novel by a long shot, but the first of (hopefully) many published with Beaten Track. The setting of the story is Maplewood, a town in Vermont - rural, picturesque, with woods, a lake and lots of touristy things to do. It's a vacation spot, and seemingly the perfect place for Hayden (our sort-of protagonist) to relocate after his husband's murder. I say 'sort-of' protagonist because there is a small band of characters at the heart of this story, but Hayden gets a little more on-page time for reasons that become apparent as events unfold. There's also some romance in store - what the author calls 'romance with a small r', and I agree with that. The relationships that bud are not limited to romance; friendships feature strongly, as does family, and some of the secondary characters are a real delight (Mr. and Mrs. Hatch, for instance). The richly described setting and often flawed characters create a stunning backdrop to the supernatural element, and we, the readers, are treated to insights that the characters do not yet have. Indeed, the novel begins with the retelling of the events from the distant past, some of which are known to the people of Maplewood. This is the beauty of the omniscient narrator; they share details with the reader, drawing us into the inner circle. It works especially well in thrillers, putting us in a state of suspense, waiting for the 'jump scare', while the character remains blissfully unaware. I must confess, I found myself muttering 'Don't do it! Don't go in there!' a good few times while editing. That said, it would be a pretty naff story if we knew everything from the beginning, so readers can expect a few twists and turns on the journey - a happy ending for many in relationship terms, a solid conclusion to the main arc, and an intriguing hook for the next novel. Closer by F.E. Feeley Jr. is available in paperback and ebook formats from Beaten Track Publishing and all the usual places. F.E. 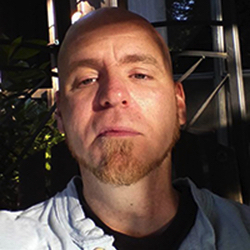 Feeley Jr is a poet and the author of six published works - four full length novels, two short stories featured in anthologies, and a good deal of poetry.